This is a vegetarian dish with non-veg touch. I love non-veg, but most of my friends are vegetarians. This recipe is specially for them to taste this wonderful side dish. I love this brinjal fry with curd rice & also with poruchakuzhambu. Even the brinjal haters too love to eat this dish. I got this recipe from my friend's mom, when I was doing my Under graduation. But I tried this recipe only last october month. It was in the draft list for months. I don't want this simple recipe sit in my draft list yet. So I edited this post today . Wash the brinjals and sliced them into circular pieces. Add all the ingredients except brinjal and oil into the blender and blend until it comes to a smooth paste. Pat all the sliced brinjals with this paste and allow it to soak for 10 to 30 minutes. Heat the pan with 1 or 2 spoons of oil, align few pieces of masala patted brinjals on the pan, add 1 or 2 spoons of oil again and allow it to get cook on the bottom side. Once the bottom side is cooked, turn them to the other side to cook as like the same. Make sure there should not be raw smell in the brinjals. It will spoil the taste of the dish. Do the rest as same. Serve it with any rice. We made brinjal fry in different way. Loved your version. 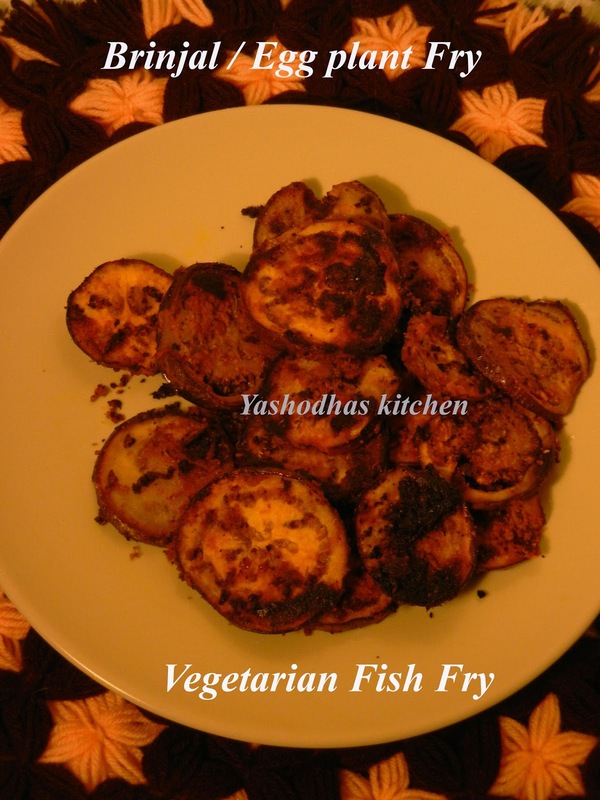 Such a delicious eggplant fry..Lovely side dish..
Yashodha, thanks for joining us for VT, i'll send u a invitation for the gmail group of VT..and post ur vegan dish every 1st and last thursday of the month.Thanks again.